I finally got around to it, my first official blog post, for all many of my facebook posts resemble that of a blog I’v been told… ! This week marks a very big change for the fund, and for my life with it, it seems! Dominic was staying with a guardian who took him in after he had no one to take care of him… but it has become apparent she may not of took him in with his best interests in mind. Dominic told us how some days he would work in the shamba/farm for his new Mama, but she would not feed him, and he would watch her and her children eat, whilst he would watch on hungry. I think it’s safe to say this lady saw Dominic as a business transaction of cheap/free labor, and not as a son to love, as he loved her and her family. It is dangerous for the average child to have such a bad diet and devoid nutritional intake as Dominic endured, but with little Dominic it is all the more dangerous. Dominic has been through more in his young life, than most people will face in a lifetime…. Dominic lost his mother and father to HIV/AIDS when he was younger. This left him to live with with his 5 brothers and sisters. Tragically Dominic over the years then lost his siblings to the virus also…. This left him alone, the only surviving member of his family. 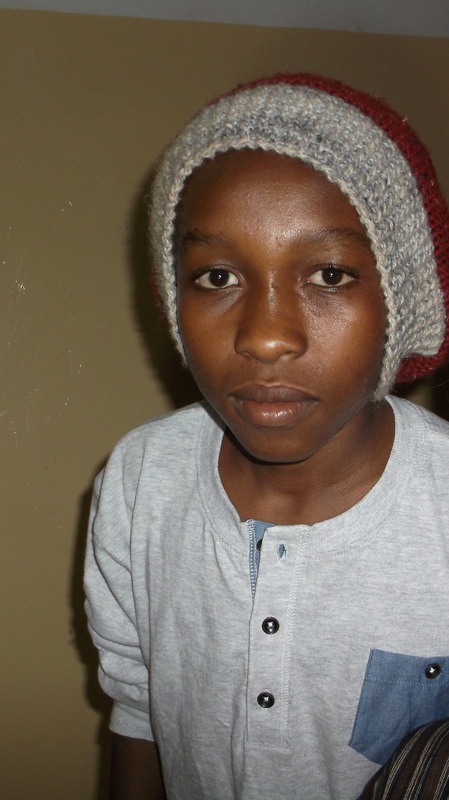 It is with the heaviest of hearts I say this, but sadly Dominic is also carrying the HIV virus…. The virus has stunted Dom’s growth, and he is much shorter than average for his age, and his age is a little unknown to us with it. To look at him you would say 10 or 11, but he is a teenager now. I sat under a tree in the village on Monday listening to Tom (my new member who Cia and Elizabeth make monthly donations of to pay his salary!) Thank you guys!!….. talk about Dominic and what had gone on, but before he had finished speaking my mind was already made up, that the only way I could guarantee Domininic a secure and loving home, with the correct nutrition and care when he is ill, was to have him come and live with me. He was so cautious, and so wide eyed at everything happening around him. As he arrived of course the rescue dogs were out, and all came to greet him! He looked terrified bless him! until i knelt down with him and the pack that was! I must admit, almost immediately i loved this little boy, whose prized possession was a tattered and faded photo of his Mama. I kept thinking that he could teach most people i know 4 or 5 times his age, a valuable lesson in love and gratitude. I am finding things a little bewildering, and I am very conflicted about it all in truth…. I guess I will learn as time goes on how to deal with all of these smaller issues I am tackling, but for now, loving Dominic is much louder than any thought or fear I have, so it’s not too much of a worry. I have other fears, but they are much more practical! For instance this house has no electricity! Which is now a problem…. It has a solar panel, than can power one lamp and a phone and a laptop no trouble. Anything above that, and the cheap make shift invertor I have overloads. It never bothered me when i was here alone, i don’t mind living basically, i find it reminds me that my basic living in the old run down center, is still luxury to tens of thousands around me. For now the strangest thing is not knowing how to think or feel, as a rule I stay as positive in life as I can muster, about all situations I face…. So we talk about his future, him becoming an engineer, and it makes me happy to think of it… then I look at him, and I worry if that day will even come, which is not like me, but it’s hard to not prepare for the worst a little bit. I hear so may stories, today I had an email from a friend explaining that her friend was showing hardly any symptoms after meds and targeted nutrition. Then last week I had to read a post from a new friend of mine Joseph, who had a child die in his arms from the virus as he ran to the hospital.